I’m so late on this post, again. 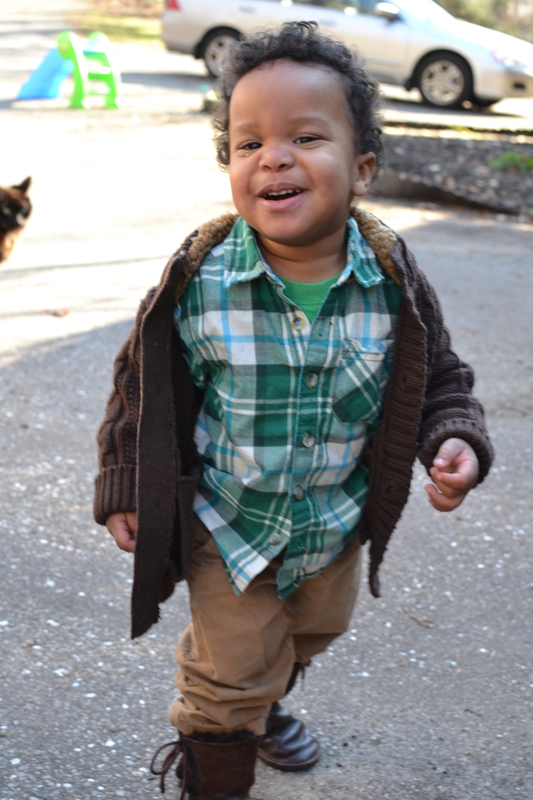 Isaac turned 21 months on the 23rd of January. 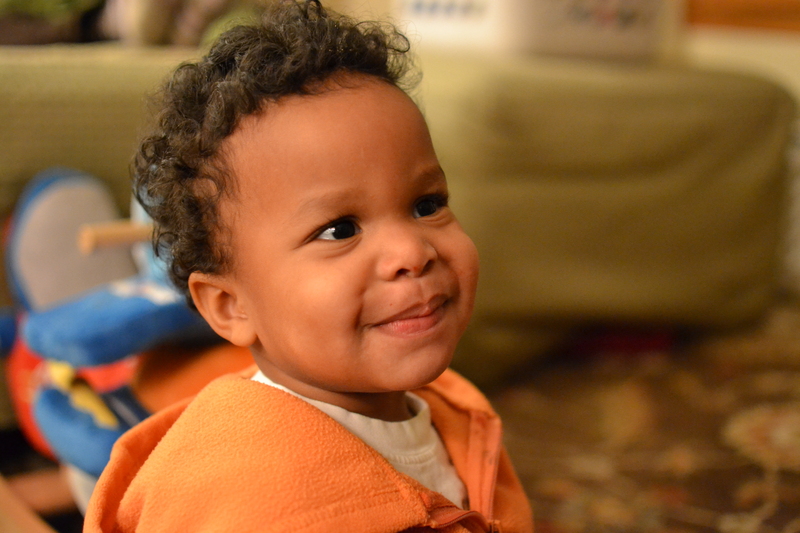 He’ll be 22 months this next week. His second birthday is just around the corner now! Our little man is all about the hugs and kisses lately. He is so affectionate all of a sudden! 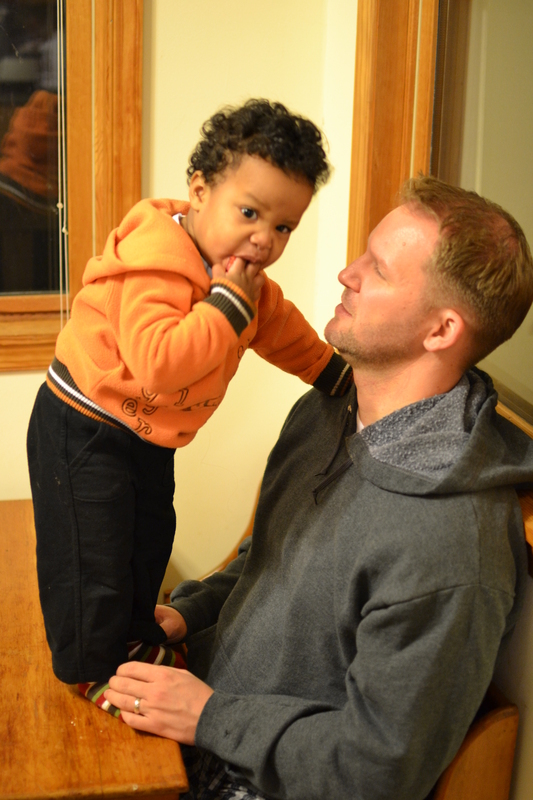 I mean, he always was pretty affectionate, but now that he’s starting to talk he can ask for hugs or kisses when he wants them…and he does, all day long :). 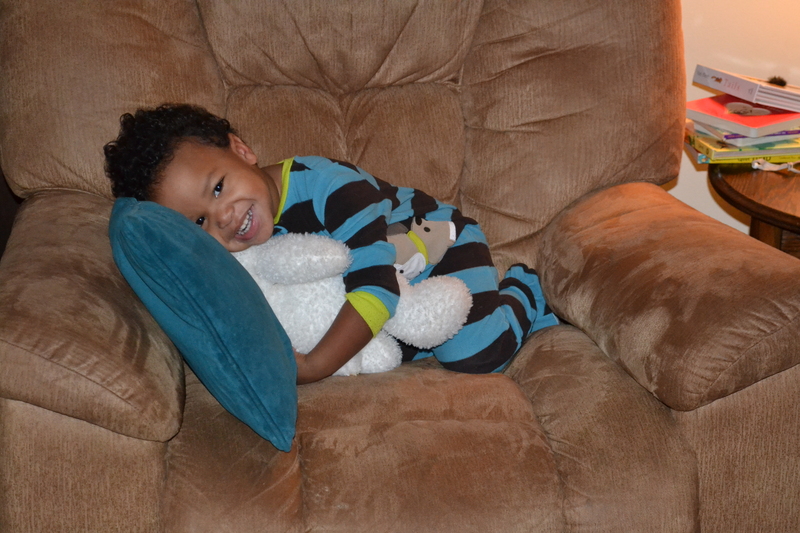 He asks for hugs when he wants to be held, when he’s upset, tired, scared, or when he’s getting fussed at (redirection!). He also uses the request for a hug when he’s trying to reach something, haha. He had opened the silverware drawer and stuck Piglet in there, then had trouble reaching in to get him out again. He stretched his arms up to me and asked “hug?” with the sweetest face, then as soon as I had picked him up, just reached over and grabbed Piglet out of the drawer. Smart boy. He loves kissing his stuffed animals, and this morning after smooching his white bear, made Mommy and the doggies give him kisses as well. No matter the reason, I never get tired of hearing his little voice asking for a hug or a kiss. Anytime, my sweet baby! 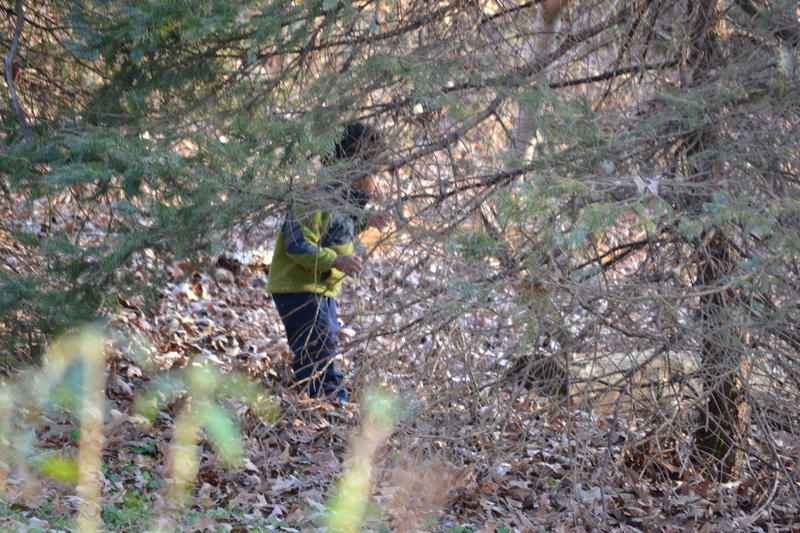 His favorite animals right now are of the jungle variety – lions (ROAR! ), tigers, monkeys and snakes being clear favorites (probably because the sounds they make are so much fun). 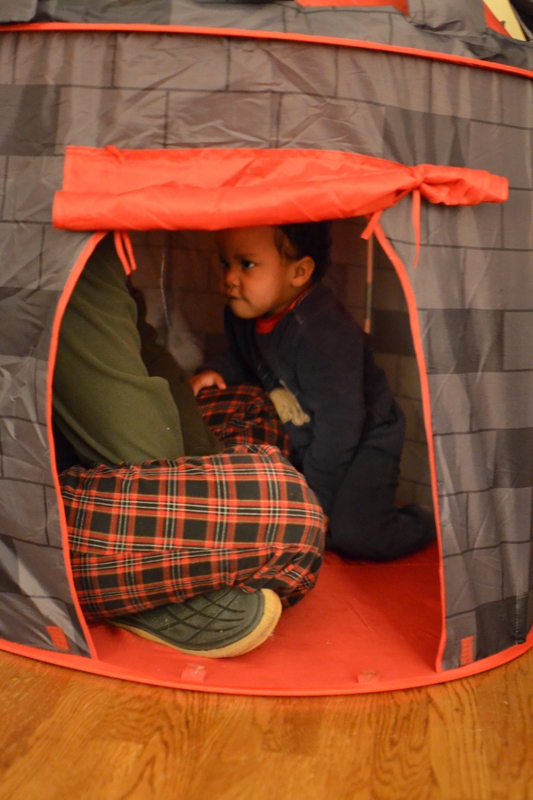 He’s started to play differently with his toys, and his imagination is beginning to bud. He’ll stuff his animals into his train, making train noises and riding them around. 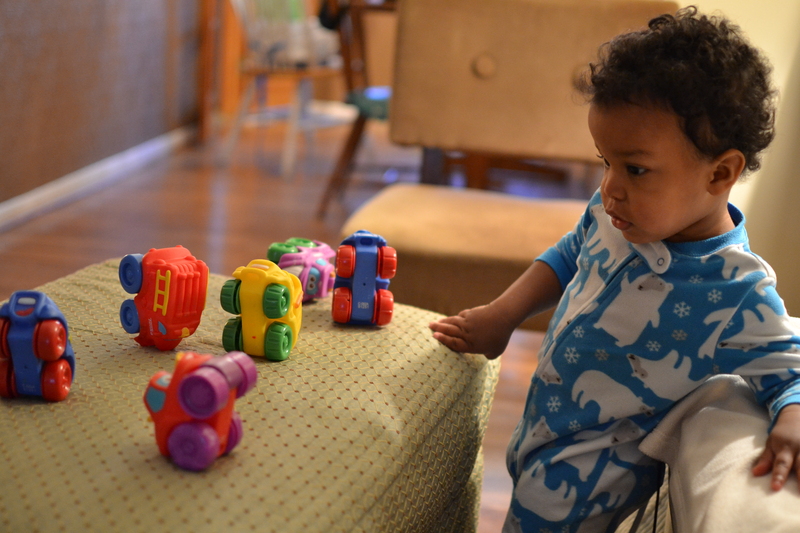 He carries his little cars around by the handful, and will “zoom” them across any available surface. 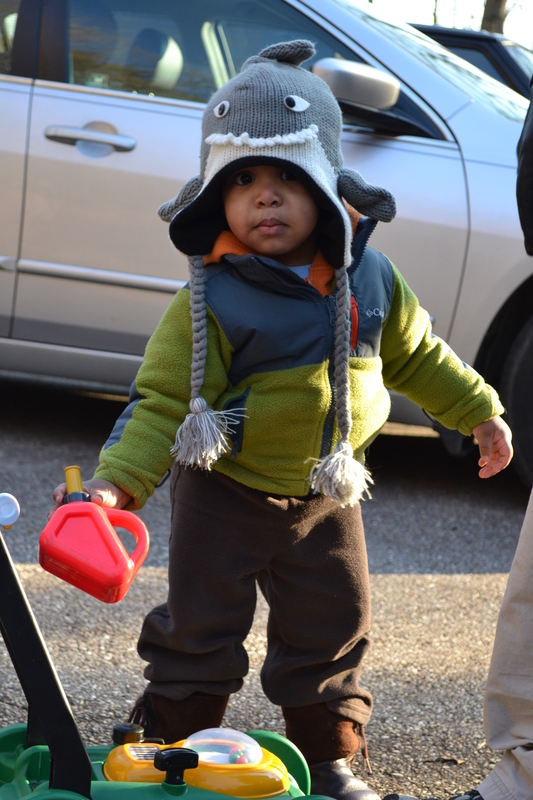 He’s getting more into cooking with his little stove, and will pretend to fill up cups of water, while making running water sounds (“shhh”), and sprinkling “salt” in his pots and pans to season his food. 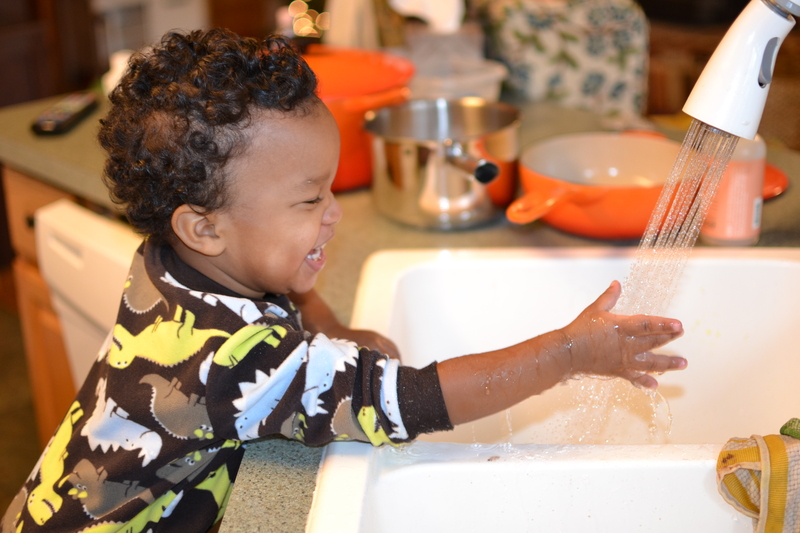 He loves washing his hands, and several times a day will ask to climb up to the sink to wash. 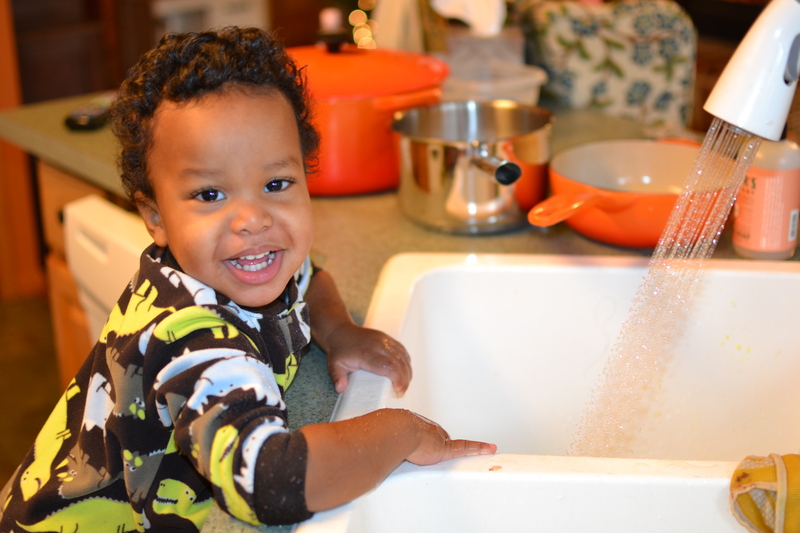 He also loves helping Mommy wash dishes and cook. 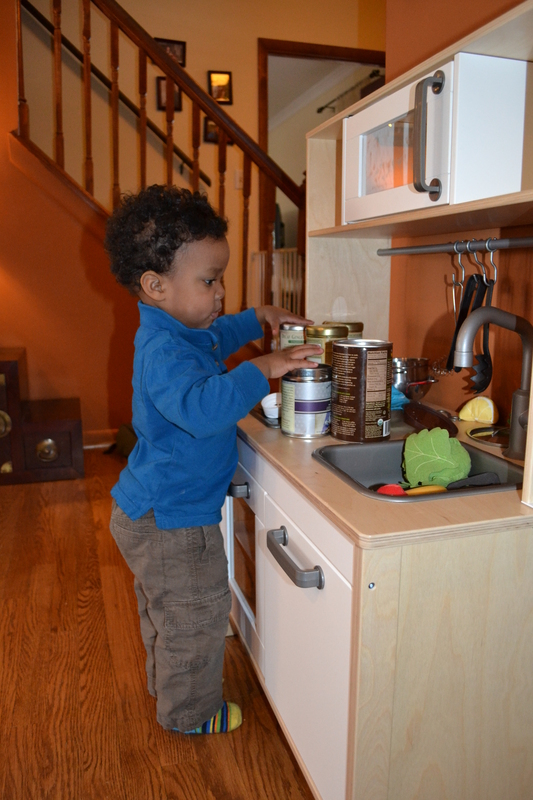 It’s so much fun having a helper in the kitchen! His favorite playtime, as always, is outside. We’ll spend an hour or two out in the morning, if the weather is nice, and an hour or so in the afternoon after his nap if we can. Sometimes we’ll go for an evening walk. 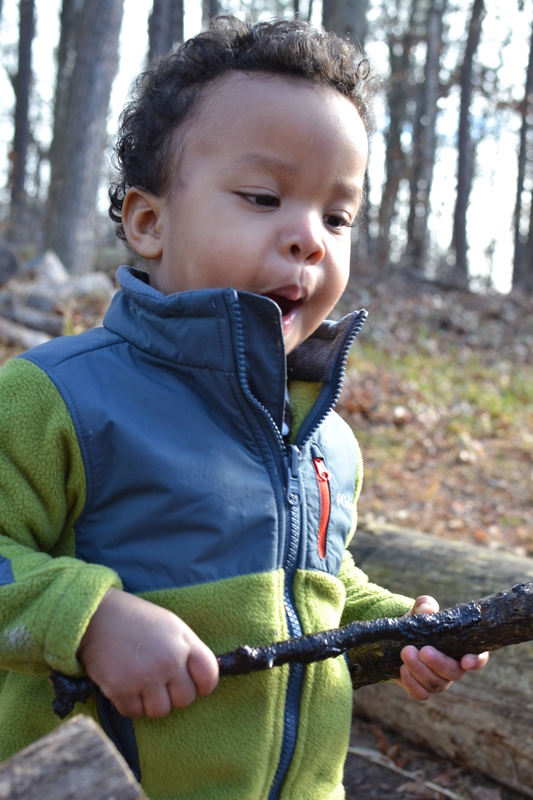 He loves picking up sticks and rocks, and carrying them by the handful. 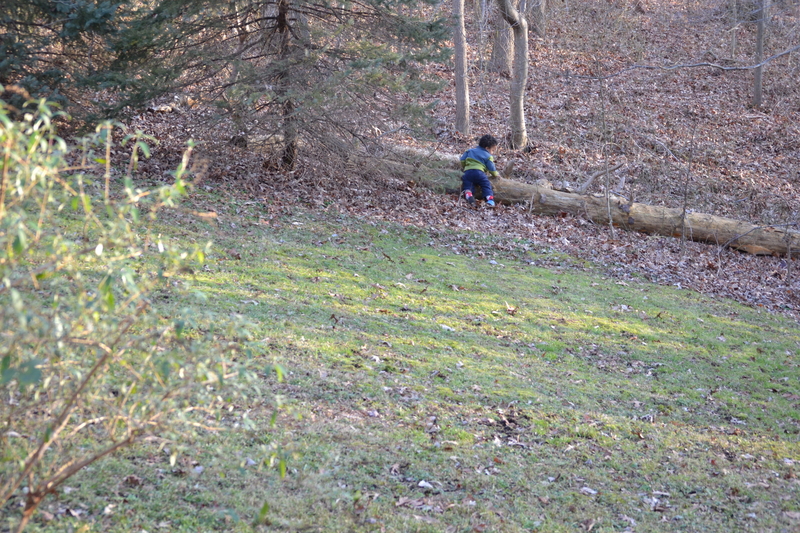 He’ll find a giant tree branch and drag it all over the neighborhood. 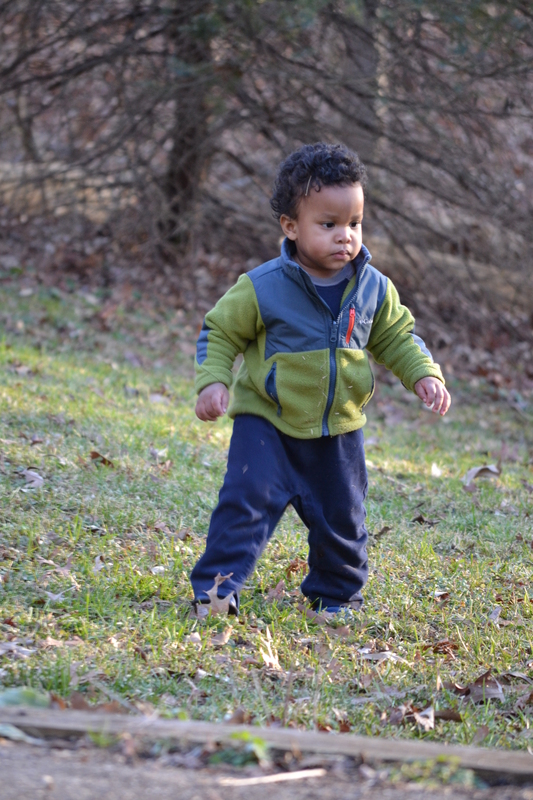 He loves wondering around in the woods, inspecting leaves and climbing over fallen trees. When we’re headed out for a walk, he’ll start calling the dogs, “Eddie, Babby! Weesh!”. He wants me to put them on their leashes and take them with us. Isaac has been rather obsessed with pointing out bugs recently, and we’ve had a lot of them around thanks to this very mild winter. Just in the last couple of days though, he’s started to act a little scared of bugs. Or things he thinks are bugs, rather. He’ll point at a piece of lint or cat fur, or bit of leaf or twig that the dogs brought in with them (let’s just ignore what that says about the state of our floors, okay?) and cry out “bug!” and then back away slowly until I’ve removed the offending particle. In the bathtub, suddenly he’s a bit wary of the tag on the washcloth, declaring it a bug and then trying to climb out of the tub to get away from it. He’s not scared of actual bugs, though, as he loves pointing them out in books, and doesn’t seem fazed by the stinkbugs I’m constantly finding and flushing (nasty little buggers), and loves, loves, loves letting “baby bugs” (lady bugs) crawl all over his hands (when one gets away, he asks “again? again? hands? hands? baby bug?”). Isaac knows his numbers – he can identify one through five, and eight. The rest are hit or miss. He can count to two, but most of the time after he does, he’ll start chanting “two-one, two-one, two one” in the most hilarious little voice. I wish I could get it on video! Every once in a while he chants “three-one” instead. He knows a couple of his letters, but other than “A” and “P”, he can’t identify anything consistently. He loves standing things on end. 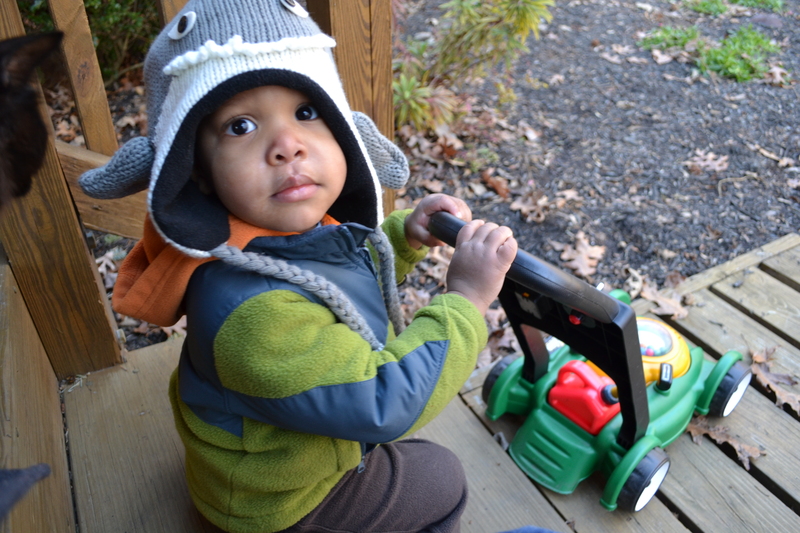 He’ll stand all of his little cars on end, his bike, his “bus” ride-on toy, and anything else that has “ends”. He’ll get extremely frustrated if he tries it with something that doesn’t have a flat surface and won’t stay upright. He’s been rather obsessed with babies crying lately. One of his favorite books is Ten Little Babies by Giyo Fujikawa, which has a crying baby on the cover. Every time he sees it, he says “kying!”, then scrunches up his face and starts fake crying. When he hears a baby fussing when we’re out, he’ll do the same thing. Yesterday when I was giving him a bath, the water ran down his face and he looked at me and asked, “kying?”. I had to laugh. Silly boy :). This morning, I yawned rather noisily and he asked the same thing. 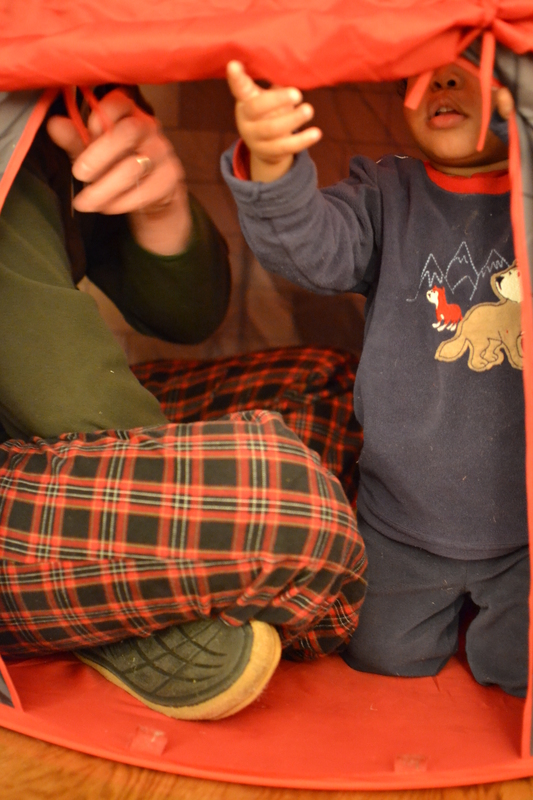 After I explained to him that I was just yawning, he did several pretend yawns and said with a giggle, “yawning!”. He has added so many new words these last two months that I can’t keep count anymore! I had created a word document to keep the count for me, but he’s up over 300 by now and still going. He breaks out new words all the time, and just amazes me. His latest phrases are “wat way” (that way), “wat one” (that one), and just yesterday “I want/wanna ____”. He said “I want juice” last night when he saw Mimi’s wine (we never give him juice anyway, so we were confused for a minute! ), but after we explained what it was, he said “I want wine”. Haha. 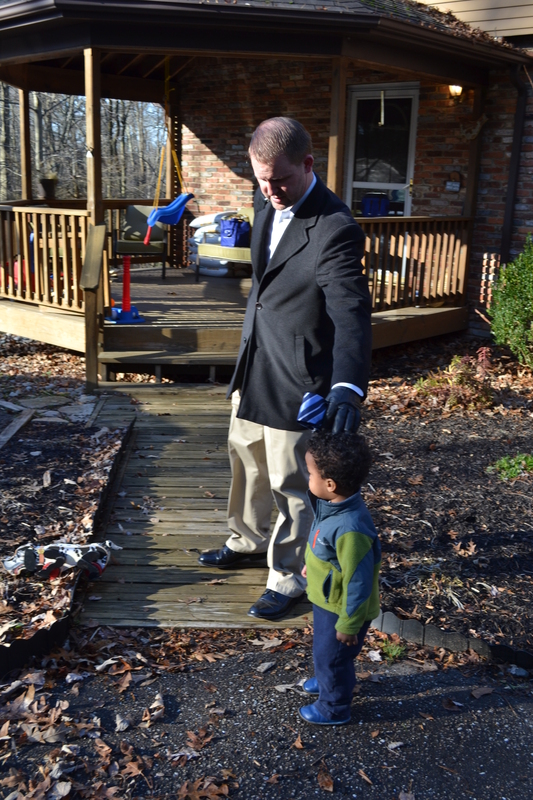 This morning he sat at the front door and said “I wanna walk”. And yesterday he started saying “hold me” instead of “hug” when he wants to be held :). One of my favorite words of his is “mut mut mohner” (coconut water). It cracks me up, because he knows how to say the hard “c” sound, and when I say c-c-coconut water, he’ll say “c-c-c…mut mut mohner”. We’ve been doing some swimming at a nearby indoor pool, and now at bathtime, he’ll lay on his belly and kick his legs and say “weeming!”. He gets all bent out of shape when he sees a stray hair in the tub or just around the house (what can I say, I guess I shed a lot more than I realized), and will yell “hay-yir” (it’s definitely a two syllable word) until I remove it from his sight. Isaac can also say his name much clearer now. 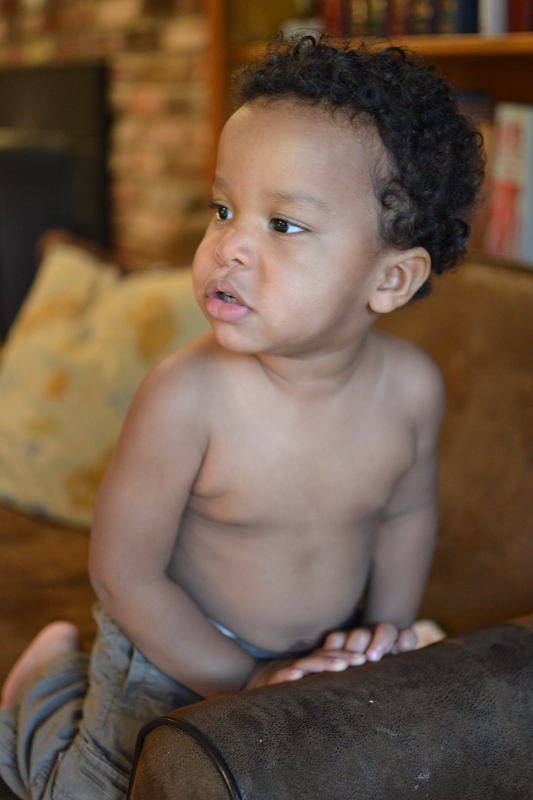 It sounds like Yazick, and every time he says his name he points at his chest proudly, like “that’s me!”. With all this talking, it’s been quite a feat to keep Isaac quiet in Mass lately. He doesn’t like to sit still, so now that he can talk he makes his displeasure at being contained in a pew known to everyone around us. “NO! NO! NO! ALL DONE! BYE BYE! CAR! OUTSIDE! ALL DONE!” Sigh. It’s embarrassing, to say the least. I absolutely LOVE hearing him talk. 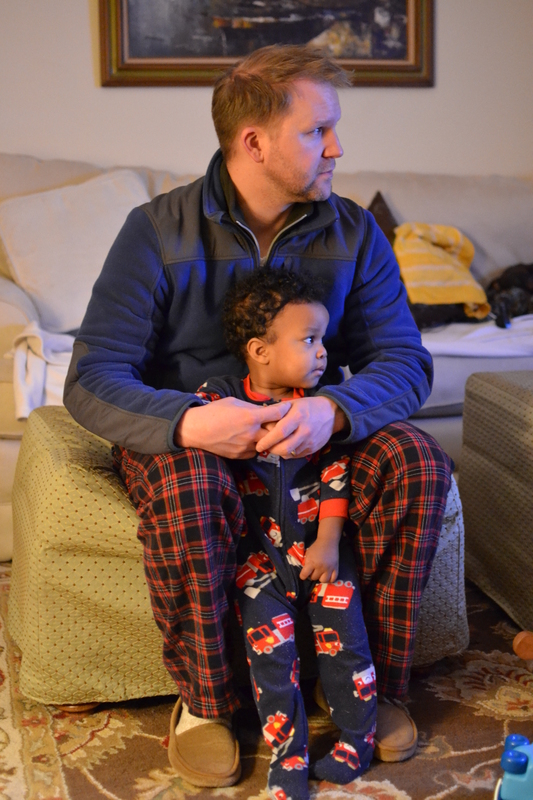 I love hearing all about fire trucks, trains (“choo choo twain”), buses, cars, tractors, motorcycles, horses, bugs, lions, sticks, rocks, and all those precious boy things that fill his mind these days. He still adores reading, and still prefers Daddy to read to him. I’ll catch him reading to himself a lot more lately, though. 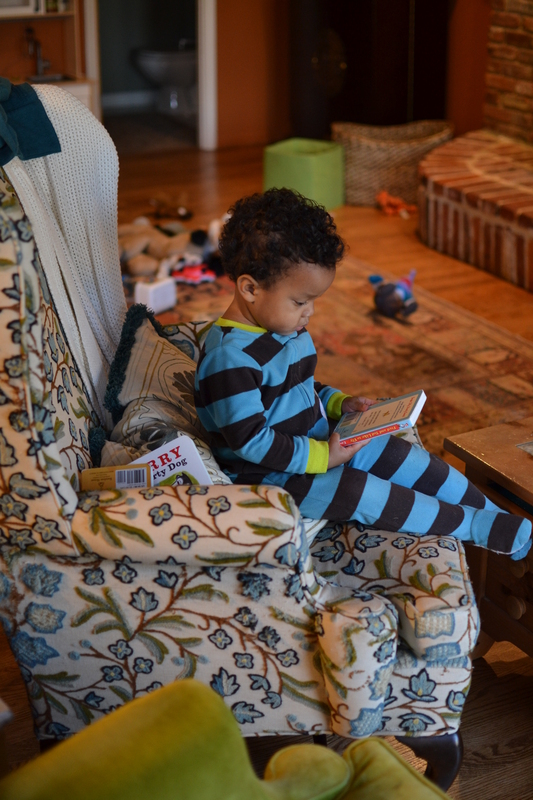 Just this morning, I heard his little voice in the living room and peeked to see him standing at the recliner reading “The Ear Book” to himself. I was surprised to hear him saying the actual words on the page! I guess I shouldn’t be too surprised, given we read his favorite 10 and 20 times a day :). 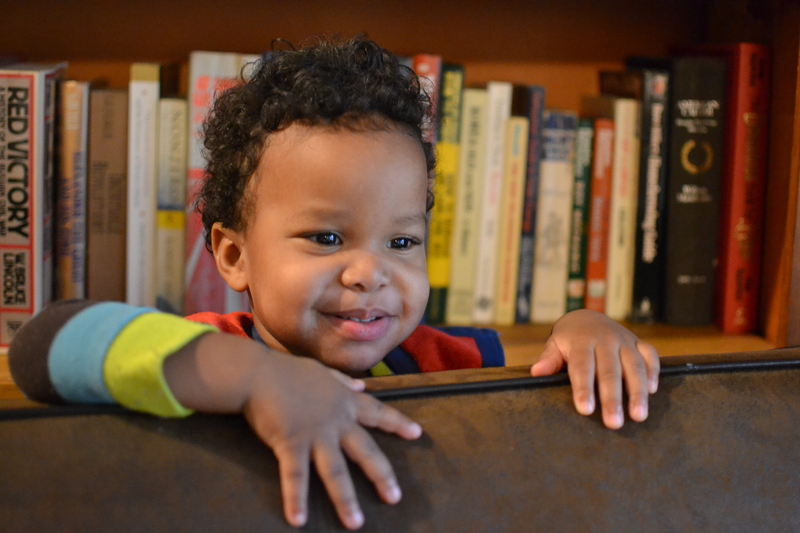 He has names for all of his books – he’ll stand in front of his bookshelf, and I’ll hear “Ear…nope. Baby…nope. Oops…nope. Daddy…nope. Cars….nope. 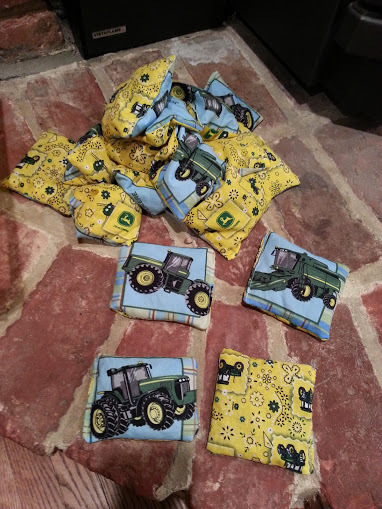 Quiet…nope.” as he tries to pick out one to read. 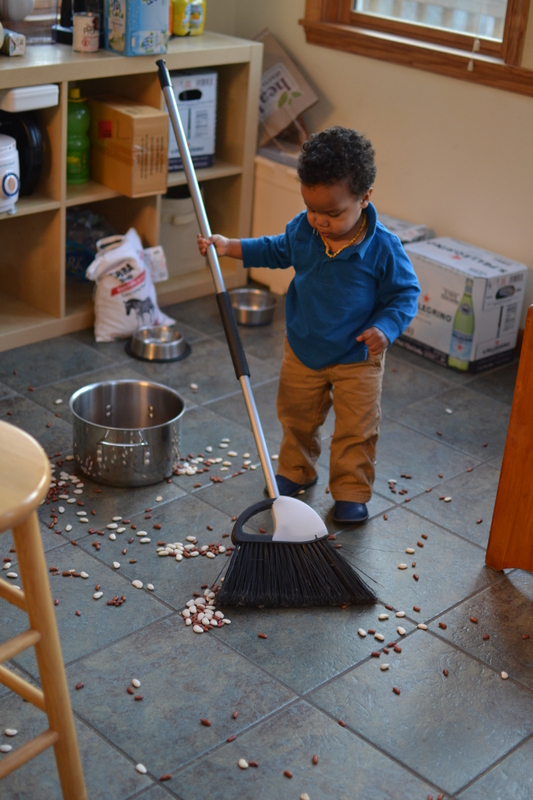 We had some extra beans, and I’ve been letting Isaac play with them in the kitchen. He pours them back and forth between a couple pots, using a cup and measuring spoon. 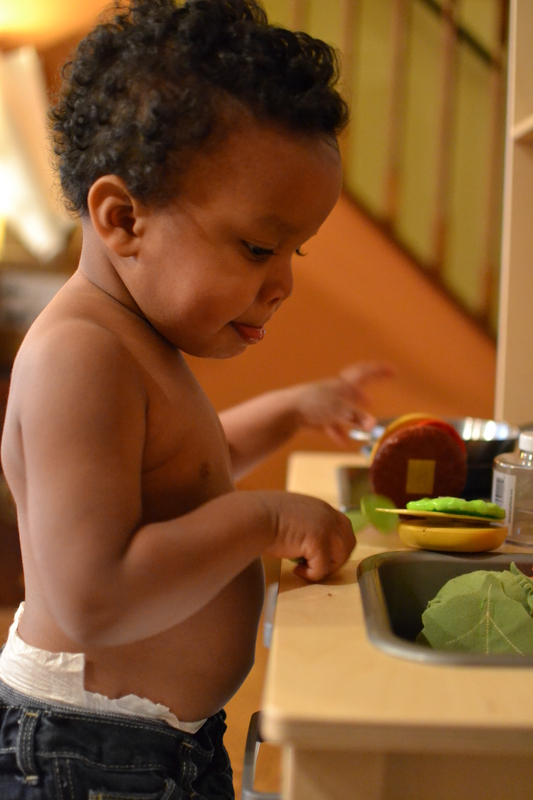 He generally makes a huge mess, but it keeps him busy for at least 10 minutes so I consider it a win, especially when I’m trying to get dinner going. The other day, I was listening to him play when I heard him say “Oops! 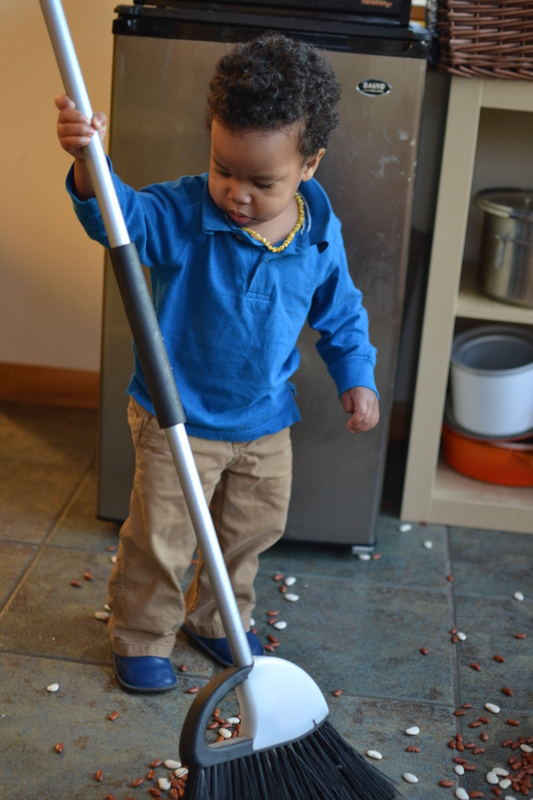 Mess.”, then watched him walk into the dining room and heard “Broom!”. He came around the corner with the broom, and told me “Sweep. Mess.” And he gave it his best effort! 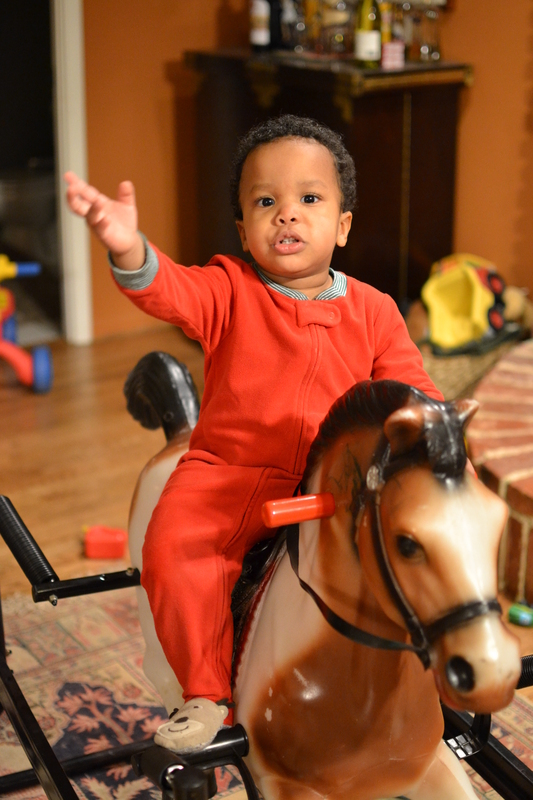 Recently, Isaac has been trying to “ride” his little horse figurine, and he was getting rather upset when he realized he was too big and the horse was waaay too small. 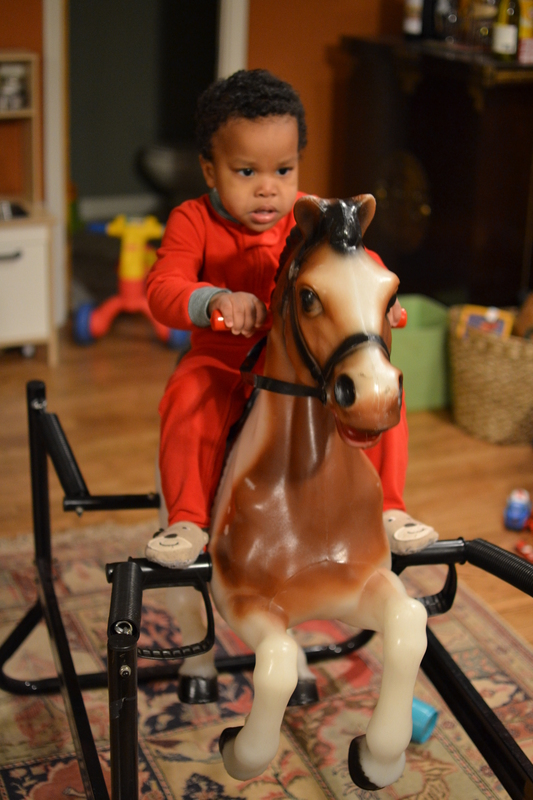 I found one of those cool spring horses on Craigslist, and it was an instant hit! 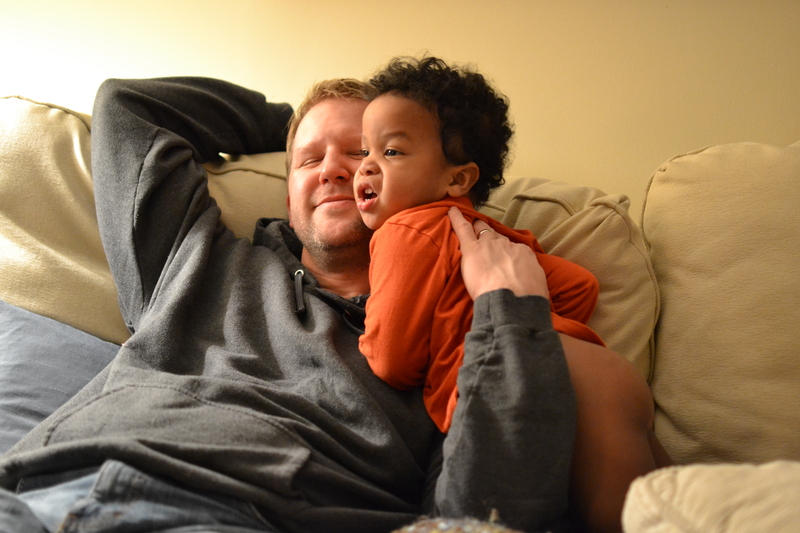 Isaac can’t get enough of his Daddy these days. He talks about him all day long, and hates to see him leave for work in the morning. 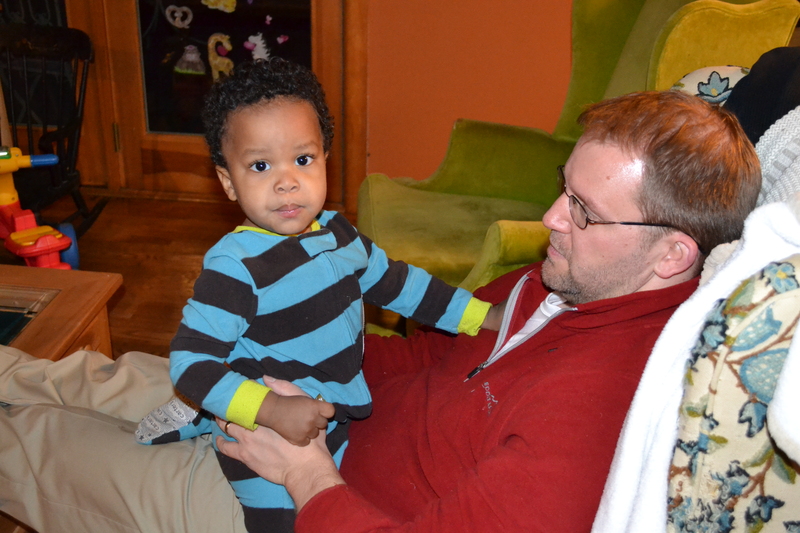 On the weekends, he’s Daddy’s little shadow, soaking in as much Daddy-time as he can before Monday rolls around again. Obviously, I need to get out from behind the camera a bit more! I don’t think I have a single picture with me and my little guy from these last two months :(. Every day is full of so much fun with our sweet little guy. I can’t believe how fast the time is flying and how much Isaac is changing every day. We love him so much! February 19, 2013 in being a mom, Isaac.